Lot’s of people think they have to create a Roku account with a credit card or a Paypal account. This can be a turnoff for people interested in getting a Roku device. Lot’s of people don’t feel comfortable giving out their credit information when they feel they don’t need to. With Roku, there is a way to bypass the credit information. It seems that some people are being ask to pay an activation fee to use Roku. I want to let people know right now that there is no activation fee to use Roku, period!!! What I mean by already paid for a service is that some people already paid for a service like Netflix or Amazon Prime prior to getting a streaming device. They may feel there is no need to give out more credit information. I too agree and feel the same way. I do have Netflix and don’t feel I need to give out more credit information to any more services. If you didn’t pay for a service, there are free channels you can watch. These channels don’t show the best or latest shows, but they do have a pretty good selection. It’s pretty simple to bypass the credit information. Click on the link below and begin here. People were commenting about tips because apparently, just clicking on the link doesn’t seem to work anymore. Stelly’s tip is the same, but she added way cool humor to her tip, I just couldn’t leave her out as she was the first to make this suggestion. Thanks Stelly! once you get to the credit information you can scroll down and just click the “Skip, I’ll add later” button. This way you don’t have to worry about that till the time comes. I myself don’t want to add stuff until the time comes. We got enough going on in our daily lives. We can only deal with what we can and only want to deal with stuff when the time comes. If you already created an account and provided your credit information, you can also remove that account and add one at a later time. Some of us still can’t find that skip, I’ll add later button. I know it’s been a stressful day. I’ve had my days like that as well. Sometimes there are people that feel more comfortable contacting customer service. Plus, you may have other questions. This way you can get all your questions answered and you will get a positive experience using your Roku device. You can also contact Roku (888) 600-7658 and let them know that you don’t want to add any personal Credit Information at this time. Roku will help you setup your account and bypass that credit information. Some people like to read and don’t want to talk to anyone. You can also go to Roku’s website and get more information. On Roku’s website, there is a plethora of information right there. I enjoy going there and learning about new features and just getting to know what the company is all about. You will not be able to order any services through your Roku device unless you add your credit information. What will you miss by bypassing your credit information? Nothing, I think anyone giving out their credit information should do it with comfort. This is your money and financial information and you shouldn’t have to give out your information if you don’t feel comfortable doing it. There are several ways to bypass giving your credit information, plus sometimes we just want to add info as we go. That’s what streaming devices are all about. Having more control of what we want and when to pay. 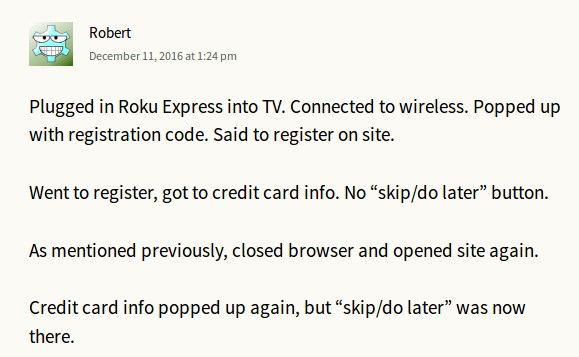 If you have any questions or comments about bypassing your credit information on a Roku device, let me know below. I BOUGHT 2 ROKU. SET ONE UP WITH CC INF. HOW CAN I REMOVE THIS INF? DO I RESET MY DEVICE AND START FROM FRESH? ALSO CERTAIN CHANNELS LIKE OWN AND HGTV FOR EXAMPLE ARE LOCKED WITH A KEY. SPOKE TO REP AND HE SAID I NEED TO SPEAK TO MY PROVIDER. CAN YOU HELP? Hey Carmen, No you do not have to reset your device. To remove the CC, Under settings, got to accessibility, then caption mode and there you can turn it on and off. As for the channels that are locked, If you have cable or satellite TV, you would call your cable company to unlock those channels. If you don’t, there are streaming services. The streaming service you’d look into is DirecTV NOW because they have OWN on their plan. Their plans are a lot less than cable, but you are looking at a monthly fee. If you have any other questions, please don’t hesitate to ask! Solved my issue here by returning mine to the store two hours after I bought it. The Roku chat people just play dumb when you tell them you won’t provide credit card info. I get why you return the product and I feel that is an issue that Roku has. I feel that Roku should eliminate the credit card info from their set up process. I feel that it causes people more problems and money because of these weird scams going on when people set up their Roku products. To be fair, Roku can really dominate the streaming field because I just purchased my mom a Roku TV and she absolutely loves it. She also has another smart TV called Hisense and I don’t recommend them at all because unlike Roku, you will get the worse apps out there. I’m bringing this up because Roku does offer a great product to people, however the process of setting up Roku products is ridiculous and they are losing good customers like you because of it. Thanks for your thoughts, really appreciate it. I bought a Roku in January and still haven’t created an account. It really peed me off when they asked for credit card info. What’s the purpose of an account anyway, when already paying a monthly fee to Netflix? A person should just be able to stream to the new TV and be done with it! I hear you that you shouldn’t have to place your credit card info when you already have the choice of apps that you prefer to use. I hope you were able to create your account without placing your credit info inside of it. You can absolutely do just remember to refresh your screen. All the best Max. Please someone help me. I am living in Mexico and trying to set up my Roku. Every time I go to the set up page it is in Spanish. I cannot make phone calls for help. Anyone have a solution? Hey Robyn you may want to check out some free VPN software. It will allow you to use an IP address in another country so that way you can set up your account, hope it helps, Evelyn. Hello Daniel, I want people to look at the name that replied to Robyn, He had a number and I called that number and it was a scam number. I’m not going to post the number because it contributes to what these scammers are doing. Know that you do not have to use your credit info to create a Roku account. Also know that you do not have to pay a fee to set up your Roku account. Roku is a device or a tool that helps you stream from the internet to your TV. It’s not like cable or anything like that. Just think of it like hooking your smart phone, computer or tablet to your TV. I have a Samsung 8plus and was fooling around and pushed the smart view button which told me it was connected to Roku..669 and then a blue box with a tv outline stayed on my screen. I have antenna tv and don’t have Roku? What’s happening? Hey Christine that is odd! It is probably because a lot of phone devices can do screen mirroring and I believe that is what your phone was attempting to do with your TV. We are trying to get You Tube on my daughters tv, but it is not allowing it. Anyone else have this issue? We have Netflix now. Hi guys, I just purchased a Roku Express today. I went through the same issue. I called a tech number I found online and he told me someone would call me in 10 minutes. Twenty minutes later “Paul” called me. I could barely understand any of them as they must be from another country. He offered me a senior citizen discount. I told Paul that I’m not a senior citizen and he said I’ll give it to you anyway. I asked how much is the subscription and he told me $149.95 for a lifetime. I told him to call me back later as I knew it must be a SCAM! So I signed out of the Roku website and tried closing my browser (explorer) several times. So I decided to go through my chrome browser and it showed me the “skip, add later” button for CC info so I immediately clicked the button and it took me to the page where you enter the code from the Tv. I added the code and it worked. No CC info added! Blood pressure is now up and I’m not a happy camper with this whole deal. I was ready to take the Roku back to the store. The world we live in is ridiculous place. Hey Rocky, I agree that the world we live in is a ridiculous place. It seems that the internet can be infested with scams. Thanks so much for that tip with changing browsers. We appreciate you taking the time to leave a comment, it will help us out. Blessings to you! Thanks everyone I’m not a tech person. But I bought a roku stick. I always read everything I can find on google to answer all my questions. This is a great way to help me, Wish me luck. I’m going to hook it up tomorrow night, I’ll let you all I know how a poor techy gets it done. Worked for me first try! Thank you so much! Hey Courtney that is great! I DO NOT HAVE A CREDIT CARD BUT NEED TO PAY MY MONTHLY AMT. OF 9.99. HOW CAN I MAIL IT TO YOU?? ?IF I CAN’T MAIL IT TO YOU AND YOU CANCEL ME I WILL GO TO ANOTHER PROVIDER. Hey Nancy Roku doesn’t have a monthly fee, if you’re referring to a streaming service like Netflix, you can contact the streaming service and make arrangements with the provider. I called to different Roku tech support number because I was trying to renew a subscription. My screen keeps telling me my address is invaild even though I have updated it multiple time. Both lines said I will need to pay a hundred and something dollars for a certain amount of years to active my device. I was informed there was no activation fee so I’m not sure what to do. Hey Morgan, there is no activation fee, Please do not pay an activation fee. I’m getting so upset that people are duped out of their money by some scam artist out there hacking into services to dupe people out of their money. What Steve B did in the comments below was reset his TV. Maybe you should try and rest your TV. Also go directly to Roku’s website and all the info is there to get in contact with a real customer service rep. I hope this is helpful, if you are still experiencing issues, please leave a comment again so we can get it resolved. Evelyn. Hi Morgan I’m having that problem as well I even called them & to me it all didn’t sound rigbt the guy said for a fee of $150. To get it going when I purchased the Roku @ best but the lady told me all I have to do is download netflix from my Phn that I have an acct w/so here I’m stuck because when I purchased got home set it up I was able to see on the home selection there was netflix & now it’s not there so please if u r anyone else can help me please thank u. Hey Stepheni, try refreshing your browser a few times and see if that helps. Do not pay any fees at all. I would also recommend that you reset you roku device and see if there are any updates. Unplug your Roku device, I would also recommend go to your router and press the rest button for 30 seconds. Let everything reload and see what happens. On your computer please clear your cache and cookies. I also recommend running a virus scan. Everyone should run a virus scan on a daily basis before they log into anything online. I hope this helps if you have further issues feel free to leave a comment. I just tried setting up my Roku account and they wanted $70 from me. That didn’t sound right to me when everything I read said it was free. Chat service person said it was a one time fee for setting up service. ? What the What? I told her no I would need to research this more and so glad I found this page. Thanks Guys new it was a scam! Thanks Karen for expressing your experience! Blessings to you, Evelyn. I had the skip/do later option on my iPhone, but selecting it just refreshed to the same screen and wouldn’t go on. I read through this and decided to try it on the computer. It worked right away on the computer, so those who are on a smartphone and not getting it to move on to the next page, try a computer. Hey Jen, thanks for the tip, much appreciate it! Thanks for the tip… it worked wonderfully. I had to re-open the browser 3x times but the third time I was offered some small text to click and bypass the cc info. Hey John, it seems like Roku has changed this so many times, Lol, I’m glad you were able to bypass the cc info. I guess you can say the third time is a charm, Lol. Enjoy your TV, Evelyn. My CC was already in my account because I dont think “no CC” was an option at the time. Can you remove it or make purchases PIN Protected? Thank You! Hey Lisa, you can remove it, I would suggest you call Roku at 1-888-600-7658 and explain to them that you do not want your credit card account listed on your Roku Device. I personally suggest that if you want to make a purchase, you can also go any steaming service like for example Netflix… What you can do is go directly to their website and make a purchase there. Then when you go back to your Roku TV, all you would have to do is, select the streaming service you want such as Netflix and add your email and password to your device. I hope I was helpful and if you have any other questions, feel free to ask. 🙂 I also want to add because some people select the wrong phone number or Roku website and they get caught up in some sort of strange scam. There is never a yearly fee or any fee when you call Roku. I don’t want to use credit card right now and there is not a skip and do it later button, Can you help me? Try and refresh your screen and see if that works. THANK YOU SO MUCH! It worked for me just now for my ROKU Express (3700R). I didn’t know anything about the payment requirement and was disappointed–even thinking of returning the Roku. I searched around for a way to bypass and nothing worked until I found your link. Yay! Thanks for this. And thanks for the other suggestions and tips just in case! (the my.roku.com/signup/nocc link above took me to the page I needed even though I’m sure I had tried that address before. When I clicked it, it took me to https://my.roku.com/index and from there I clicked Link Device, and I was able to see the “Skip” link on the payment page). I need to set up a count and does this work for my ruku express+. I don’t want to sign up and pay for wrong thing and just the hassle I have already. Is making me mad. This is real with the web site down or whatever I. Had to search more and I found this page. Now is this the right page for me? And why can’t I call some one for help. No numbers. Hey Derek, you can call 1-888-600-7658 if you’re having trouble setting up your Roku. Hi my mom purchased this roku and was told the only way it would work is that she had to pay a $250.00 activation fee which I found to be crazy. Pls explain what this money will be used for if she is streaming and its only suppose to be good for 5 years and she doesn’t get a lot of channels well the ones she would watch anyways. Hey T, there is no fee to use a Roku device. Once you purchase the device, all you have to do is set it up. I don’t understand why anyone would be charged to set up Roku. I wrote an article about this so-called activation fee because I too found it ridiculous that people are paying this fee. I also called customer service at Roku and they confirmed that there is no activation fee at all. click here to read the article. Worked like a charm! When I exited the page then went back and signed in with username and password I had just created, this time an option to skip the credit card info appeared. Thank you so much for helping me figure this out! Now I don’t have to worry about accidental purchases and someone without a credit card can just as easily use Roku also! Once I got to the payment page, I went backwards using the ROKU remote. It gave me a new code to use. Then I went backwards in the browser. It asked for the new code. I entered that and it took me to the payment page. THIS TIME, there was a ‘Skip and add later’ link at the bottom of the page. I’m not too sure of what you mean, but what I’m assuming what you mean is if you can use the Roku that your son gives you and the answer is yes. hey update everything, just bought a roku and your screen will stay black until you call customer service and pay your activation fee or it wont send the code so you can complete your account set up…..dont know when they changed this, but they did. Hey Mike are you sure because there is a lot of scams out there. These types of sites use reputable business names to get your money. I’m pretty sure there is no activation fee. I’m going to research this activation fee and write an article about it. Oh how it gets to me when people get taken for like this. I’m really upset right now. AWESOME! Roku has been getting shadier each year, but this work around (close browser, navigate back to roku.com) worked like a charm. It’s a shame they try to trick you into giving them information. Give us choice! Thanks for posting this article. Really very useful all Roku users. 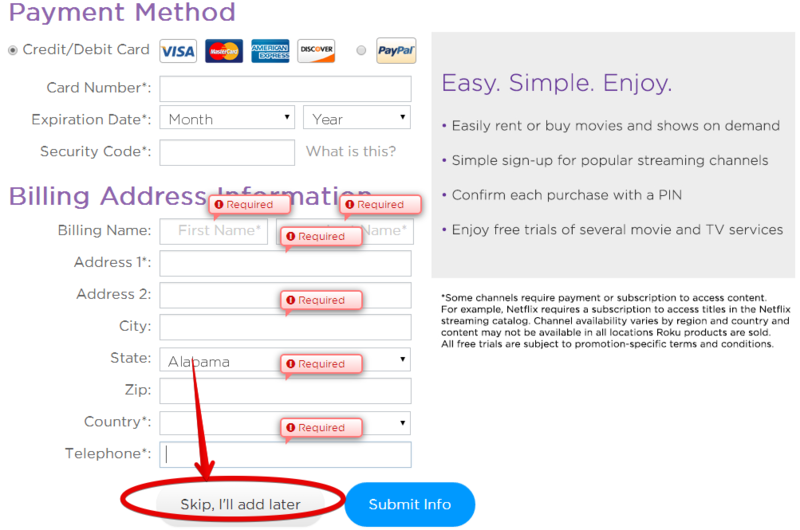 This article explained the best way to create a Roku account without a credit card. I just plugged in my Roku and went to the website to activate. There is NO “skip this step and add later ” check box. You need to update this article or take it down. I will try ignoring the page and proceeding. Plugged in Roku Express into TV. Connected to wireless. Popped up with registration code. Said to register on site. Went to register, got to credit card info. No “skip/do later” button. As mentioned previously, closed browser and opened site again. Credit card info popped up again, but “skip/do later” was now there. There are some free apps that you can use, but there not as great as Netflix, Hulu or Amazon Prime. Thank you so much for the tip! I bought a Roku for my parents and they were afraid to add their credit card information. hi I l already gave them info before reading this I went on the site and deleted the payment info is it now all gone?? no cookies or tracking I need to worry about?? thank you so much for any and all help. I just created an account after buying a Roku TV (November 27, 2016). I was no way going to put credit card info on their servers. I did not find any skip buttons, the links I found for no credit card / nocc did not work, and I was trying to figure out what to do. Then I just closed the browser on the page that was prompting me for payment info, and logged back in the information I had entered for email and password. And the account works, there is no payment information populated in the account, and I’m good to go. So the easiest way to skip entering the info is to literally just skip it. Just quit entering data, close the browser window and rock on. Pretend you never saw it. Like when someone asks you a question and you just ignore them and don’t answer. Just don’t answer! You ROCK, I was getting frustrated as the screen image shown is a bit out of date. I did what you suggested and SHAZAM, as soon as I re-opened the browser I was logged in and Good to Go, You Da Man. Thank you for these great directions. I’ve been intimidated in even setting all this up and had the sticks for about 6 months now … and have been paying tons of $$ for cable. But, today I am getting everything done and you just helped immensely with the process. Thank YOU! I just want the Roku for simple tasks. Though, I already own a playstation 3 amd chromecast. The main reasoin why I wiould want from Roku is an ad free. Hey David, I agree with you about giving away personal information. Roku does offer a lot of free streaming services. People can also go online and pay for something like Netflix that way. Hi, Are there free channels like TV5, TVA, RDI, CTV, CBC, etc? Hey Kito, If you wondering if there is live streaming there are some news channels that you can stream live like CBS news. As for watching free tv, you would need an app like hulu or netflix, here are some other channels you can check out here. Thank you so much for this information! It was very helpful. Thank you so much for the link ! I wanted to return my Roku device to the store as I didn’t want to provide with my credit card info . But when I saw your link I created account without payment information and all free apps works great now. Thanks a lot !!! Thank you so much! I was very bummed until I found your article and it actually worked! Thanks and have a great evening! Actually, I found it quite clear and not offensive to the author whatsoever. She was responding to a part of the article where it said customer support was not helpful. Her additional comments were simply her personal experience with the Roku , which I’m very glad she shared. I’m not sure I want it either if there are tons of commercials with the free stuff. I think before someone writes off what someone says and unclear, or confusing, or assumes it’s rude they should take another look to makes sure they aren’t misunderstanding it. It’s true CoCo’s comment seemed to start in the middle of an idea, but if one thinks back to the article it’s easy to pick up what she’s referring to. Someone else above needed to use the same link but with a locale string added (the ?locale=en_us) part. That may be necessary if you haven’t first visited the standard form page. Roku makes this difficult with clear intention and there is no mention of the link on their website. The device seems good and the setup experience starts well enough, until the credit card part. Apple also does this when setting up software updates and it stinks there too. I do need Roku to stay in business so that the software on the unit is forever maintained but at the same time I don’t like supporting a company that brings a customer to tears even once. I’m a techie who doesn’t need support but many people are at the mercy of Roku’s CS, after paying for the device and before being able to use it. That means CS has to be top-notch every time and that can’t be guaranteed with a distant outsource bidder. So I’m ambivalent toward Roku at the moment, but the box itself (a Roku 3) seems fine so far. Because the “https” means the connection is encrypted, and you should never send personal information unencrypted. But it doesn’t matter in this case because the Roku site will redirect to the secure link. Thanks for the info. The link worked and I didn’t have to enter my credit card. I felt the same way. If u cant clearly communicate CLEARLY u should not be a phone rep. And even after u get the free movies, there are A LOT OF BREAKS AND COMMERCIALS to make u fed up and start buying stuff. I got this ROKU because I don’t have a lot of time to watch TV or a movie but when I do I wanna be able to without pay a $80.00 and up cable bill every month! IM VERY DISSATISFIED!!!!!!!!!!!!!!!!!!! Your commentary is not at all CLEAR! What are you talking about? Feel the same way as who? I’ve looked thru the thread and don’t have a clue what you are talking about – what has a cable bill got to do with a Roku box? I have read that the Roko customer service is from India and the reps are hard to understand…maybe that’s what you mean but the rest makes no sense. This write-up by Evelyn is excellent and well written. I was thinking about getting a Roku 3 but was not sure after reading a LOT of complaints about problems with the boxes, poor customer service and setup problems. I tested Evelyn’s method using a fake name and email – was able to bypass the credit card requirements as she said. I removed the fake account when I was done. It is unfortunate that Roko only provides phone support which has to be paid for. On the other hand, there is a wealth of info on the web so you probably don’t need them. Hey Tom, thanks for the compliment, you’re very correct that Roku has a wealthy of info on their site. I could sit there for hours and read all their info. I was a little taken aback by CoCo’s comment, I think she wrote it out of frustration. As for creating an account, I personally feel that Roku should make it easier for people to bypass their credit info. I personally feel that people will buy when they are ready or feel like it and trust me they will, lol. I know I have. The number you provided was great, though the little ‘Easter egg hunt’ they led me on (press this number for this, that number for that, etc) was a bit challenging. I tried the link you provided, but it wasn’t quite enough; it took me tho the same spot with the cc request and no option to skip. Hey Rhonni, Thanks for sharing the link, I guess it changes at times. I’m glad you were able to set up your account without using your credit card. 🙂 I will update my site and let people know about the link you provided. 2. Signed in to featured topics in the popup that appeared when I loaded the support page. 3. Chatted with online support (bottom right of window). 4. Explained that I am unable to activate Roku device without a credit card. 5. They provided a link where “skip this step” is available. I was on the Roku (streaming stick) site with one of your employees for nearly an hour(maybe longer). She was from India. I am sure she was doing her best, but I am almost done signing up, except for trying to do it without entering a credit card(or debit) payment method. Finally, she said, hurriedly, “I am sending you a link to the “nocc “part and you can enter that and finish. I could not understand her…..I told her that in the beginning. (I had tried with the online instructions, and could NOT figure it out). SO, I called the c.s. # and got the lady from India. I am now in tears, shaking all over, and had to go take a tranquilizer. I wish I had NEVER gotten this Roku!!!!! If you can’t employ people that we in America can understand, you will lose a LOT of customers!!! I told her right at first that I couldn’t understand her. Shouldn’t she THEN have given me someone in our country so I would not be at this place? I am feeling like I may have to go to the hospital if my nerves don’t calm down. TRYING to understand her and do what she said was a HORRIBLE experience!!!! If you don’t change your ways, and get ppl that speak English fluently, you surely will lose customers!!!! NOW, I can’t figure out how to finish this without entering a credit card number, and so all of this was for nothing!!! What is WRONG with employing people from the United States??? This was a horrible experience for me……HORRIBLE!!! And I STILL haven’t gotten it so I can use it!!!!!!!!!!!!!!!!!!!!! I can understand how important it is to be able to communicate to someone when you need assistance. I feel that companies should really to take the time to listen to their customers. I’m sorry you had such a bad experience. Let see we can resolve this issue your having.